Your trusty old hi-fi has served you well for many years and still pumps out amazing sound, but you’ve developed FOMO since your friends all have something in the line of a wireless speaker or Bluetooth speaker. In our opinion, you should have “Fear of Missing Out” – because you are. The most obvious advantage of a wireless speaker or Bluetooth speaker is – wait for it – there are no wires. No rocket science there, except the many impressive developments from the big manufacturers who are determined to free audiophiles from the chaos of wires. Yes, there’ll be the arguments that wired speakers offer better sound quality for obvious reasons (a physical wire being involved), but this is changing fast. Wireless and Bluetooth speakers have caught up in every respect of delivering excellent sound. So much so that it’s quite difficult to have a decent argument about this at dinner parties these days. Truth be told, your guests wouldn’t know the difference if you plugged in a wired speaker or let rip with a wireless or Bluetooth speaker. Then, there’s also the fact that manufacturers just never stop evolving their designs. Most of the leading brands are true pioneers in their field; legendary designers of audio products for decades. The improved design of wireless and Bluetooth speakers is evident in the market today, as customers continue to be blown away by what’s out there. Choose your weapon – HEOS by Denon, Klipsch, NAD, and Polk – the big boys of sound. A good place to start is the HEOS 1. We say this because we know you’re going to want to take your music outdoors a lot of the time. This baby features a silicone splashguard to protect it from water while you’re partying on the deck or on the beach. The included Bluetooth functionality in the HEOS 1 means no wires required and no WiFi connection either! If you hook up your smartphone to the HEOS 1, you can listen to your tunes and charge your device at the same time – no more running low on battery power when you are miles from your charger! The USB port provides a 5V/1A output, the same as regular phone chargers. 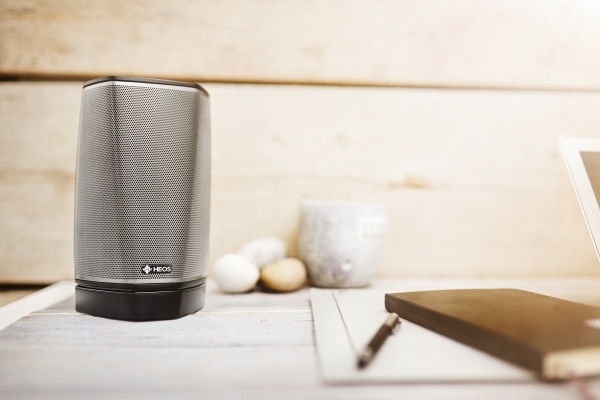 Take it up a gear with the Denon HEOS 3 HS wireless speaker. This speaker loves small to medium spaces, like your bedroom, kitchen or office. Play cloud music, music that’s on your phone or tablet, or music from a USB, and play it through Bluetooth if you like! With features like two custom full-range drivers and a two-channel class D amplifier, all controlled with state-of-the-art digital signal processing, you’re in for high-res audio of the finest quality. And, the sound is optimised via precision acoustical processing algorithms that originated in top recording studios. Why not configure two HEOS 3 wireless speakers to work together as a stereo pair? Are your ears missing out on the best in wireless/Bluetooth sound? Explore your options today! Klipsch THX Ultra2 – The Home-Entertainment Audio Series You Absolutely Must Have! Listen Up! Brand New from Klipsch – The HP-3 is Here!